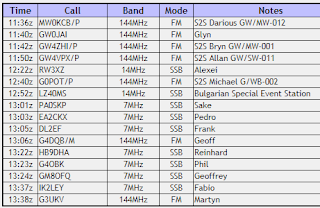 M0PLA/P SOTA Activations: 13th March 2018. Pen y Garn SOTA Activation visit. 13th March 2018. Pen y Garn SOTA Activation visit. Grid SN 798771, Altitude 611M. 8 a.m. and headed towards Wales on the A5, we had decided on Welshpool, Newtown and via Llangurig. The journey took us 2 1/2 hours to reach the car park area at grid SN 80089 77686. This is the same spot that I parked last year and makes the walk to the summit an easy 20 minute walk. Simon set up his mast, Yaesu FT-817 and a slinky, then started operating on 40M, I set up my mast, 20/40M HWEF and my homebrew 2M yagi. 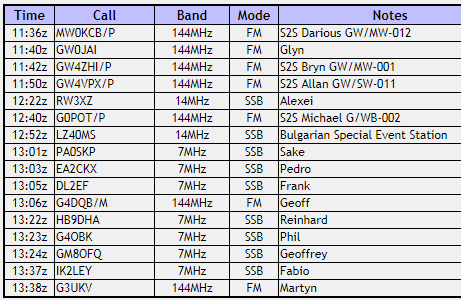 I started by having a quick check of the band and heard MW0KCB/P (Darious) on GW/MW-012 so went straight in with a S2S, a good start I thought then ended up with 3 out of my first 4 calls being S2S's. After qualifying the summit I went onto 20M and my first contact was RW3XZ (Alexei) near Moscow, this kept on for another two hours, with contacts all over Europe. The weather held out and was a great day out, plenty of contacts for us both and as a usual Telford Radio club outing we had a debrief on the way home at a nice public house in Welshpool. Thank you Simon for accompanying me for the day. 10th March 2018. Tal Y Fan SOTA Activation visit.